For the men it was Russia’s day as Dmitrii Sharfutdinov and Rustam Gelmanov turned in superior performances in the finals, topping 2 more problems than their nearest competitors to take gold and silver respectively. Jorg Verhoven took bronze which was a nice result for him after just sneaking into finals in 6th qualifying position. America’s Paul Robinson was looking to return to the podium in Vail—something he did back in 2008—but he had to settle for finishing in 6th position. The women’s event was quite interesting as both Angie Payne and Alex Puccio emerged from an absolutely punishing semi-final round1 to represent the U.S. in finals. As has often been the case with the women this year, finals came down to who could execute each problem with the fewest falls. 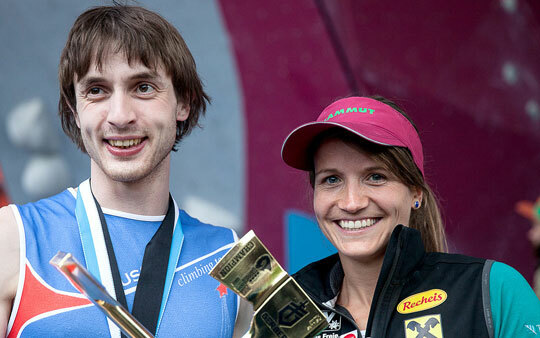 All three of the top finishers completed all four problems in a total of nine attempts, but Anna Stöhr had fewer tries to reach the four bonus holds so she came out victorious. Akiyo Noguchi and Alex Puccio both also finished each problem, but it took them both 2 extra attempts to reach the bonus holds with the tie between them broken by a countback to their results in semi-finals. Angie Payne wound up finishing in 6th position. If you missed any part of the comp, you can re-watch each round in their entirety here. It’s been a really impressive season for both of them. Even when Anna hasn’t dominated she seems to find ways to pull off the gold. Dmitri has had some really impressive performances this season as well. There have been times when it didn’t look like he was even going to make finals and then finds a way to mono crimp a bolt hole. Pretty fun to watch. My one gripe with this event was that the Vail comp is traditionally more power oriented than the rest of the circuit which is usually a nice change. This comp appeared pretty technical for Vail. bonus holds in less tries which gave her the gold. Oops! Thanks for the heads up. Hi, I wave watched this year’s bouldering competitions videos all day, and I am unfamiliar with the way the athletes are ranked according to their performances… I know it has to do with the number of tops according to the number of tries and bonus holds, but it is still pretty blurry to me… if anyone could take a minute to explain me or send me a link so that I can understand what is going on that would be awesome! I agree the score system can seem a bit confusing, specially in written form like 4t9, 4b4 etc. 1. First you count the number of tops. The climber who get most tops will win regardless how many tries they need. So, doing all 4 boulders in 12 attempts, (4t12) is better than to flash three bouders and failing on the last one. (3t3). 2.If climbers ends up whith the same number of tops, then you are considered better if you have done it in less attempts. In vail Dmitry won because he needed fewer attempts than Rustam to climb all boulders. Because it is just four or five boulders to climb, climbers will of course end up with the same number of tops all the time, so to keep down the number of attempts is very important for the climbers..
3. Routesetters try to build problems that some climbers can do quick and others not at all to get a good spread of the results. But quite often several climbers ends up with both the same number of tops and attempts.That is when the bonus holds are used to rank the climbers, they are used only to separate climbers that ends up with the same score. In Vail Anna, Alex and Akiyo all topped out all boulders in nine attempts, but Anna won because she reached the bonus holds in fewer attempts. 4. It could happen that also the bonusscore is identical for several climbers. Then you look at the result in the previous round to separate who did the best competition. That happened to Alex and Akiyo in Vail, in the end they had the exact same score in the final, but Akiyo was better in the semis and therefore got the silver medal. Man, you are awesome, you must have taken quite a while to write that! Thank you so very much, it is extremely useful, I understand much better now! I think the part that confused me was the fact that you don’t count the tries that a climber does if he doesn’t top or reach the bonus hold… Anyways, thanks again for taking the time, it is much appreciated!